Although researchers and educators agree that small group collaboration is an essential part of teacher education, not much attention had been paid to examining the dynamics, characteristics, and processes of online group collaboration involving teachers in a peer-led context. Yet, understanding how online teacher learning groups evolve and what conditions facilitate or hinder learning in such an environment is important to inform teacher educators about optimal ways to organize and facilitate group learning in teacher education. The purpose of this study is to investigate group characteristics and processes that impact peer-led group discussions and the role of the group facilitators in online small group learning. Thirty-one graduate students in a teacher education literacy seminar participated in the study. The study provides a qualitative content analysis of small group collaboration and insight to support existing structures for preservice and inservice teachers' professional development. Ikpeze, C. (2007). Small Group Collaboration in Peer-Led Electronic Discourse: An Analysis of Group Dynamics and Interactions Involving Preservice and Inservice Teachers. Journal of Technology and Teacher Education, 15 (3), 383-407. Waynesville, NC USA: Society for Information Technology & Teacher Education. Retrieved April 20, 2019 from https://www.learntechlib.org/primary/p/21043/. Collins, A., Brown, J.S., & Holman, A. (1991). Cognitive apprenticeship: Making thinking visible. American Educator, 15 (3), 6-11, 38-46. Dornye i, Z. (1997). Psychological processes in cooperative language learning: Group dynamics and motivation. Modern Language Journal, 81(4), 482-493. Duek, J.E. (2000). Whose group is it, anyway? Equity of student discourse in problem-based learning (PBL). In D.H. Evensen & C.E. Hmelo (Eds.) , Problem-based learning: A research perspective on learning interactions (pp. 75-108). Mahwah , NJ: Lawrence Erlbaum. Edens, K.M. (2000). Promoting communication, inquiry and reflection in an early practicum experience via an online discussion group. Action in Teacher Education, 22(2A), 14-23. Faidley, J., Evensen, D.H., Salisbury-Glennon, J., Glenn, J., & Hmelo, C.E. (2000). How are we doing? Methods of assessing group processing in a problem-based learning context. In D.H. Evensen & C.E. Hmelo (Eds.) , Problem-based learning: A research perspective on learning interactions (pp. 109-135). Mahwah , NJ: Lawrence Erlbaum. Glesne, C. (1998). Becoming qualitative researchers: An introduction. New York: Addison Wesley Longman. Harasim, L. (1993). Collaborating in cyberspace: Using computer conferences as a group learning environment. Interactive Learning Environment, 3(2), 119-130. Har thorn , L.G. , & Ingram, A.L. (2002). Online collaboration: Making i t work. Educational Technology, 42(1) , 33-40. Leithwood, K., Jantzi, D., & Steinbach, R. (2003). Changing leadership in changing times. Philadelphia: Open University Press. McDonald, J., & Gibson, C.C. (1998). Interpersonal dynamics and group development in computer conferencing. American Journal of Distance Education, 12(1), 7-25. McLeskey, J., & Waldron, N.L. (2004). Three conceptions of teacher learning: Exploring there la t ionsh ip between knowledge and the practice of teaching. Teacher Education and Special Education, 27 (1), 3-14. Neck, C.P., & Manz, C.C. (1994). From groupthink to teamthink: Towards the creation of constructive thought patterns in self-managing work teams. Human Relations, 47 (8), 929-952. Nicholson, S., & Bond, N. (2003). Collaborative reflection and profession-a l community building: An analysis of preservice teachers’ use of an electronic discussion board. 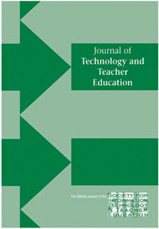 Journal of Technology and Teacher Education, 11(2), 259-279. Ny ikos , M. , & Hashimoto, R. (1997). Constructivist theory applied to collaborative learning in teacher education: In search of ZPD. Modern Language Journal, 81 (4), 506-517. Palincsar, A.S. (1998). Social constructivist perspectives on teaching and learning. Annual Reviews Psychology, 49, 345-375. Rayw id , M.A. (1993). Finding time for collaboration. Educational Leadership, 5(1) , 30-34. Strauss, A., & Corbin, J. (1990). Basics of qualitative research: Grounded theory procedures and techniques. Newbury Park, CA: Sage. Turb i l , J. (2002). The role of the facilitator in a professional learning system: The framwork project. In G. Hoban (Ed.) , Teacher learning for educational change. Philadelphia: Philadelphia University Press. Volery, T. (2001). Online education: An exploratory study into success factors. Journal of Educational Computing Research, 24(1), 77-92. Walther, J. (1996). Computer-mediated communication: Impersonal, interpersonal and hyperpersonal. Communication Research, 23, 3-43. Peer-Led Discussion: Who is the Learner and Who is the Teacher in the Online Learning Environment?